The Staffordshire Bull Terrier, also known as the Staffie, can trace their origins to bloodsports such as bull baiting which took place in England prior to the nineteenth century. In these types of events pitted Bull and Terrier dogs against bulls, bears and other animals for the entertainment of both noblemen and commoners. These dogs are the common ancestor to the Staffordshire Bull Terrier, the Bull Terrier, as well as the Staffie’s larger relatives, the American Pit Bull Terrier and the American Staffordshire Terrier. While these events were outlawed in Britain in 1835 when some animal welfare laws were instituted, another terrible event took its place. Underground dogfights took place in both Britain and America, usually involving gambling and evading the eye of the law. 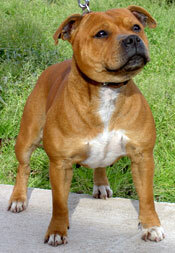 Dogs bred for these fight were tested for gameness, and this led to the heartiness of the modern Staffordshire Bull Terrier. The Scottish Terrier, also known as the Aberdeen Terrier or Scottie, predictably originates from the country of Scotland. An account of this dog existed as early as the fifteenth century, when a book on Scottish history described it in its pages. King James VI of Scotland became a proponent of the breed when he took the throne in the seventeenth century. 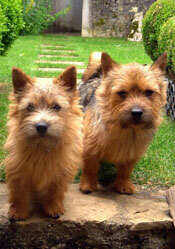 He sent six terriers to the French monarch as a gift. 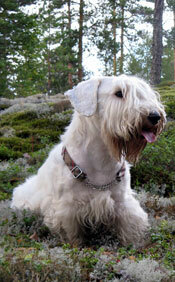 The popularity of the breed soon flourished around the world. These dogs were abundant on the Scottish Highlands, where they were used to hunt vermin, foxes and badgers. 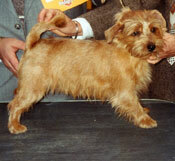 They were known for years as “little Skye Terriers”, grouped together with several other breeds. Eventually they were separated into their own breed by the end of the 19th century. 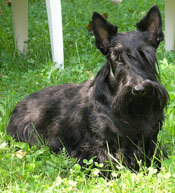 Scotties made their way to American shores in the early 1890s. They became very popular between World War I and World War II. They have found their place into popular culture, having been owned by President George W. Bush and perhaps most famously featured a piece in the game Monopoly. Manchester, England in the early nineteenth century was a center for two sports popular among the poor: rat killing and rabbit coursing. A particular dark brown terrier mix was one of the more celebrated rat-killing dogs used in these contests. John Hulme, a devotee of the sport, sought to improve the breed by crossing it with the Whippet. 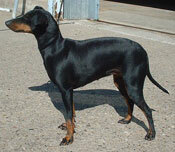 This new breed was such a hit that others continued the process, and the Manchester Terrier was born. Rat killing eventually became illegal, but these dogs proved their worth in another way. Public inns across England were infested with rats due to poor sanitary conditions. These inns kept kennels filled with these dogs, and the Manchester Terrier proved his worth time and time again. The name of Manchester Terrier is a bit deceiving. This kind of dog was found throughout England. The breed spread from Manchester, throughout the British Isles and eventually to the shores of the United States. The name was officially designated as Manchester Terrier in 1923, and it has remained so ever since. 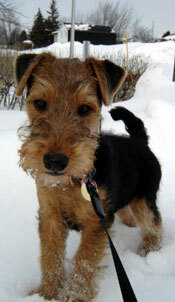 The Lakeland Terrier originated in the nineteenth century near the Scottish and English border, in Lake District of Cumberland. The breed is one of the many descendants of the Black and Tan Terrier of the region, the result of crossing it with several other breeds. 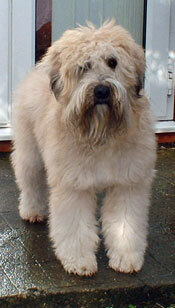 These include the Fell Terrier, the early Dandie Dinmont Terrier, the Bedlington Terrier and the Border Terrier. The collaborative nature of the Lakeland could be considered one of its defining characteristics. When working on farms, these dogs were usually kept in packs. 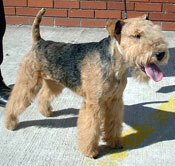 A Lakeland that was aggressive to other dogs would be quickly separated from the pack. As a result, working within a group was a trait prized by early breeders. This is one of the oldest working breeds still in use today. In the Lake District, the Lakeland Terrier has been used for generations to exterminate the fell foxes that threaten sheep folds during the lambing season. While the majority of terriers are used to bolt or mark their prey, the Lakeland must kill their quarry. Despite their tenacious reputation, the Lakeland remains a loving companion to humans.